As part of my exhibition En Route ... OF BRIDGES AND BARRIERS i designed a series of pictograms based on the traffic symbol for HUMPS AHEAD, these were stuck to a make shift wall like 'BILLS' we see on our city walls. Each pictogram dealt with a specific issue that Trinidad & Tobago is faced with i.e. the BUMPS in the road that slow our development ( Death, The Police, Traffic, Bandits, Teenage Pregnancy, Inflation and Floods). 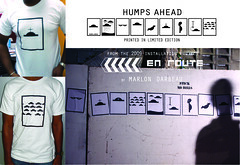 These were also translated to limited edition prints on t-shirts.